Seventeenth century painting of Afonso Henriques. Afonso I, King of Portugal, more commonly known as Afonso Henriques, (July 25, 1109 – December 6, 1185), also known as the Conqueror, was the first King of Portugal, declaring his independence from León. He played a major role in reclaiming the Iberian Peninsula from the Moors and defended Portugal from Castille, which was reluctant to recognize its independence. Conflict with Castille ended with a peace Treaty (1143), evidence that Afonso I could make peace as well as wage war. Afonso consolidated Portugal's Catholic identity, pledging that he and the nation would serve the Church. Reconquered territories were settled with a Christian population, guarded by members of the military orders. Within less than 20 years of Afonso's death, Portugal was defined more or less by its present borders, making Portugal one of the oldest 'nation-states', since countries such as Spain, France, Italy and Germany were not unified until much later. Afonso I left his mark on the map of Europe. The impetus created by his conquest of the Southern Iberian peninsular, and by the process of settling that region, would later continue to drive and to inspire Portuguese imperial expansion, as, subsequently, the Kingdom acquired a large overseas empire. Afonso I was the son of Henry of Burgundy, Count of Portugal and Teresa of León, the illegitimate daughter of King Afonso VI of Castile and León. He was proclaimed King on July 26 1139, immediately after the Battle of Ourique, and died on December 6, 1185 in Coimbra. At the end of the 11th century, the Iberian Peninsula political agenda was mostly concerned with the Reconquista, the driving out of the Muslim successor-states to the Caliphate of Cordoba after its collapse. With European military aristocracies focused on the Crusades, Afonso VI called for the help of the French nobility to deal with the Moors. In exchange, he was to give the hands of his daughters in marriage to the leaders of the expedition and bestow royal privileges to the others. Thus, the royal heiress Urraca of Castile wedded Raymond of Burgundy, younger son of the Count of Burgundy, and her half-sister, princess Teresa of León, married his cousin, another French crusader, Henry of Burgundy, younger brother of the Duke of Burgundy, whose mother was daughter of the Count of Barcelona. Henry was made Count of Portugal, a burdensome earldom south of Galicia, where Moorish incursions and attacks were to be expected. With his wife Teresa as co-ruler of Portugal, Henry withstood the ordeal and held the lands for his father-in-law. From this marriage several sons were born, but only one, Afonso Henriques (meaning "Afonso son of Henry") survived. The boy, probably born around 1109, followed his father as Count of Portugal in 1112, under the tutelage of his mother. The relations between Teresa and her son Afonso proved difficult. Only eleven years old, Afonso already had his own political ideas, which were very different from his mother's. In 1120, the young prince took the side of the archbishop of Braga, a political foe of Teresa, and both were exiled by her orders. Afonso spent the next years away from his own county, under the watch of the bishop. In 1122 Afonso became fourteen, the adult age in the 12th century. He made himself a knight on his own account in the Cathedral of Zamora, raised an army, and proceeded to take control of his lands. Near Guimarães, at the Battle of São Mamede (1128) he defeated the troops under the command of his mother's lover and ally Count Fernando Peres de Trava of Galicia, making her his prisoner and exiling her forever to a monastery in León. 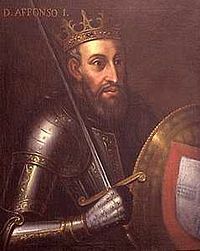 Thus the possibility of incorporating Portugal into a Kingdom of Galicia was eliminated and Afonso become sole ruler (Duke of Portugal) after demands for independence from the county's people, church and nobles. He also defeated Afonso VII of Castile and León, another of his mother's allies, and thus freed the county from political dependence on the crown of León and Castile. On April 6, 1129, Afonso Henriques dictated the writ in which he proclaimed himself Prince of Portugal. Afonso then turned his arms against the persistent problem of the Moors in the south. His campaigns were successful and, on July 26, 1139, he won an overwhelming victory in the Battle of Ourique, and straight after was unanimously proclaimed King of Portugal by his soldiers. This meant that Portugal was no longer a vassal county of León-Castile, but a kingdom in its own right. He then convened the first assembly of the estates-general at Lamego (at which he would have been given the crown by the Archbishop of Braga, to confirm this independence), although this is likely to be a seventeenth century embellishment of Portuguese history. Independence, however, was not something a land could choose on its own. Portugal still had to be acknowledged by the neighboring lands and, most importantly, by the Roman Catholic Church and by the Pope, then the ultimate source of political legitimacy. Afonso married Mafalda of Savoy, daughter of Count Amadeo III of Savoy, and sent Ambassadors to Rome to negotiate with the Pope. In Portugal, he built several monasteries and convents and bestowed important privileges to religious orders. In 1143, he wrote to Pope Innocent II declaring that he and the kingdom were servants of the Church, and promising that he would drive the Moors out of the Iberian peninsula. Bypassing any king of Castile or León, Afonso declared himself the direct liegeman of the Papacy. Afonso then continued to distinguish himself by his exploits against the Moors, from whom he wrested Santarém and Lisbon in 1147. He also conquered an important part of the land south of the Tagus River, although this was lost again to the Moors in the following years. He "reconquered more Muslim territory than any other of the Christian kings on the peninsula." . He settled Christian subjects in these territories, where numerous monastic foundations were also established. The Knights Templar was later granted territory in the South where new military orders were created to ensure the safety of the region, including the Order of the Knights of Saint James. Afonso then recruited colonists from overseas. Huge land grants were given to monasteries and to the military orders. Meanwhile, King Afonso VII of Castile (Afonso's cousin) regarded the independent ruler of Portugal as nothing but a rebel. Conflict between the two was constant and bitter in the following years. Afonso became involved in a war, taking the side of the Aragonese king, an enemy of Castile. To ensure the alliance, his son Sancho was engaged to Dulce Berenguer, sister of the Count of Barcelona, and princess of Aragon. Finally, in 1143, the Treaty of Zamora established peace between the cousins and the recognition by the Kingdom of Castile and León that Portugal was an independent kingdom. In 1169, Afonso was disabled in an engagement near Badajoz by a fall from his horse, and made prisoner by the soldiers of the king of León. Portugal was obliged to surrender as his ransom almost all the conquests Afonso had made in Galicia in the previous years. In 1179 the privileges and favors given to the Roman Catholic Church were compensated. In the papal bull Manifestis Probatum, Pope Alexander III acknowledged Afonso as King and Portugal as an independent land with the right to conquer lands from the Moors. With this papal blessing, Portugal was at last secured as a country and safe from any Castilian attempts at annexation. In 1184, in spite of his great age, he still had sufficient energy to relieve his son Sancho, who was besieged in Santarém by the Moors. He died shortly after, on December 6, 1185. The Portuguese revere him as a hero, both on account of his personal character and as the founder of their nation. Indeed, he may have founded the first 'nation-state' in that by 1200, just 16 years after his death, mainland Portugal reached the size it has today, while it was not until much later that either France or Spain became unified states. . There are legendary stories that it would take ten men to carry his sword, and that Afonso would want to engage other monarchs in personal combat, but no one would dare accept his challenge. Not only did he almost single-handedly transform Portugal from a vassal state into an independent kingdom, but through his patronage of the Catholic Church he left a distinctly Christian and Catholic stamp on the nation. When, in subsequent years, it acquired an overseas empire, the Christianization of the lands it ruled was always a priority. In July 2006, the tomb of the King (which is located in the Santa Cruz Monastery in Coimbra) was opened for scientific purposes by researchers from the University of Coimbra (Portugal), and the University of Granada (Spain). The opening of the tomb, intended to allow investigators to reconstruct a biological profile of Afonso by examining his bones, teeth or hair, provoked considerable concern among some sectors of Portuguese society and IPPAR- Instituto Português do Património Arquitectónico (Portuguese State Agency for Architectural Patrimony). The government halted the opening, requesting more protocols from the scientific team, because of the importance of the king in the nation's formation. Afonso married in 1146 Mafalda or Maud of Savoy (1125-1158), daughter of Amadeo III, Count of Savoy, and Mafalda of Albon. Infanta Teresa (Theresa) 1157 1218 Countess consort of Flanders by marriage to Philip I of Flanders. Duchess consort of Burgundy by marriage to Eudes III of Burgundy. Urraca Afonso c. 1130 ? Natural daughter. Married Pedro Afonso Viegas. Lady of Aveiro. Pedro Afonso c 1130 1169 A.k.a. Pedro Henriques. 1st Grand-Master of the Order of Aviz. Afonso c. 1135 1207 11th Master of the Order of Saint John of Rhodes. Teresa Afonso c. 1135 ? Married Fernando Martins Bravo or Martim Moniz. This page was last modified on 15 February 2016, at 16:52.